This website is centered around the design guidelines of multi-touch interfaces for elders, that intends to help the design of this type of interfaces for this target audiance. 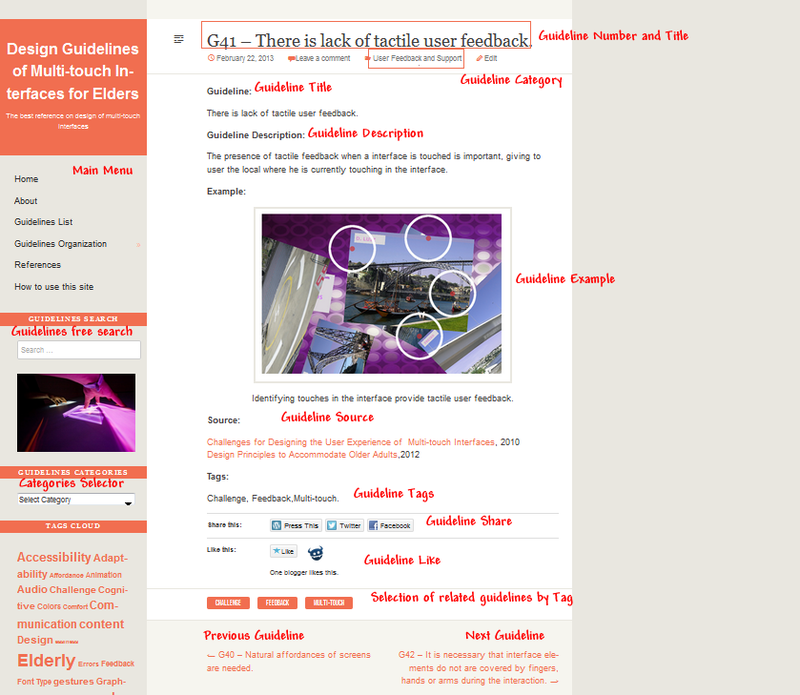 Becoming an important resource for designers, usability specialists, researchers, etc. How to access this site? 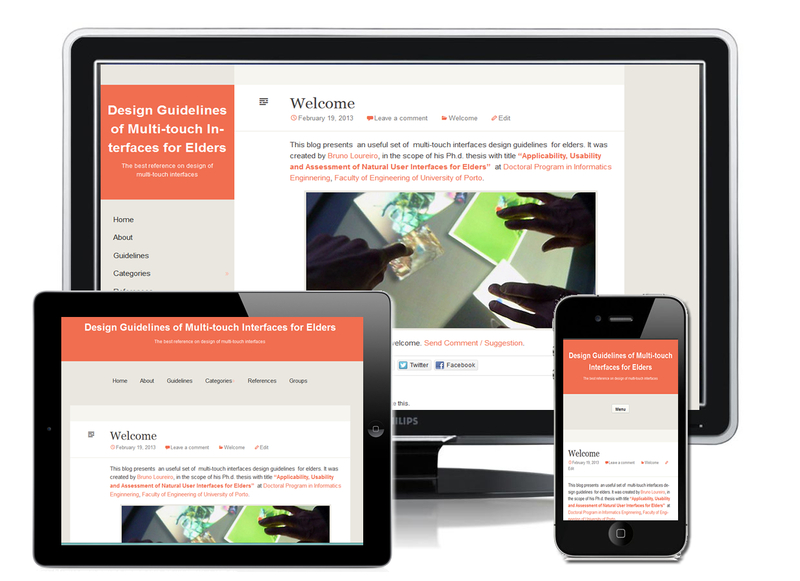 This site are available in https://eldermultitouchguidelines.wordpress.com or http://bit.ly/17ouqyF . How to view a guideline? To access the set of guidelines how can use the Guidelines List , Guidelines Organization, References , free search , selector of categories or through selection of elements in tag cloud available in the main menu. What type of contents are in the guidelines? Each guideline is characterized by a set of elements, such as, guideline number, guideline title, guideline description, guideline example, guideline source, guideline category and guideline tags. Figure 2 shows the arrangement of these elements in the website. How organized are the guidelines? The guidelines are organized by categories, whose identification are illustrated in Figure 3. What are the types of categories of the guidelines? The categories are Target Design, Use of Graphics , Navigation and Errors, Content Layout Design, User Cognitive Design, Audio, Text Design , User Feeback and Support, Multi-touch interaction and Interface Testing, as illustred in Figure 4. What kind of device is more appropriate to view the guidelines? This website was developed to provide an optimal viewing experience across a wide range of devices (from desktop computers monitors, tablet pcs, and smart phones). Website layout will be adjusted automatically with the capabilities of the device viewer (Figure 5).